Bookseller Ermine introduces our moving and heartbreaking Book of the Month for August. A wonderfully written heartbreaking tale of love, loss and the consequences of war and its effects over the years. I would definitely recommend it for anybody who wants a beautifully told story of moral dilemmas and how we will live through it. In Rome 1943, Chiara Ravello witnesses a family being taken away by the Nazi soldiers occupying the city. In a moment, Chiara, in mourning for her husband, finds herself claiming the family's seven-year-old son as her nephew, sparing him from being taken away to a concentration camp with his parents. The decision, quickly made through only the briefest eye contact with the boy's mother, changes her life forever. From this point, Baily tells the story of Chiara and the boy, Daniele, across two separate time periods. In 1943, Chiara and Daniele adjust to their new circumstances. In 1973, a young Welsh girl called Maria tracks down Chiara in the hope of finding out more about Daniele, her father. Maria, enthusiastic and hopeful, wants to know more about her father while Chiara, who has long ago moved on, learns to reconcile her feelings towards the boy she ultimately couldn't save. 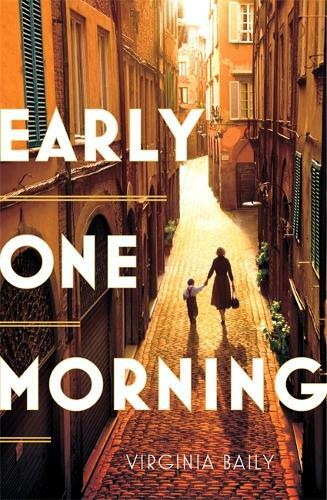 Early One Morning is a moving book about parenthood and the lasting effects of war. Acts of altruism are often more complicated than simply 'doing a good deed' and Baily examines this with skill. This book is far from your traditional Summer read which, in a way, is entirely what makes it worth your time.